The 1960’s and 70s saw flat roofs as the ideal solution in the design of public buildings, schools and Local Authority housing stock. It seemed like a good idea at the time – amongst other things, it meant easy access for installation and maintenance of plant and services. Unfortunately, some 40-50 years on these buildings are now experiencing all sorts of problems – water ingress, poor insulation performance, deterioration of the roof deck covering and unauthorised access. 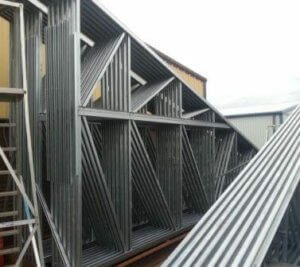 We at Dibsa Structures Ltd specialise in the design, manufacture and supply of lightweight galvanised steel structures used for converting flat roofs into pitched roofs. Our easy innovative solutions for flat to pitch conversions allow the designer to create a variety of roofscapes. Our structure is compatible with most lightweight roof coverings from secret fix sheets through to tile effect coverings, and can be used for both warm or cold roof construction. We can quickly provide outline schemes and budget prices so that a client can determine the feasibility of a particular project at an early stage. Investment in design software programmes has enabled us to offer a pictorial view of the finished design right at the outset giving the client a clearer idea of how the project can look on completion. One such project is Stonelow Green in Dronfield, Sheffield. 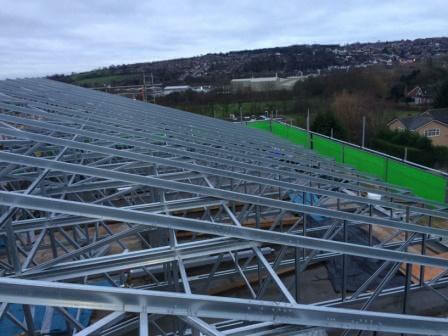 Now working on the fourth phase of its refurbishment programme, three blocks of original flat roofs have been over-roofed using the Dibsa truss system. The flats have been converted into two deep mono pitched roofs with our lightweight steel structure creating a modern clean look for the residents.